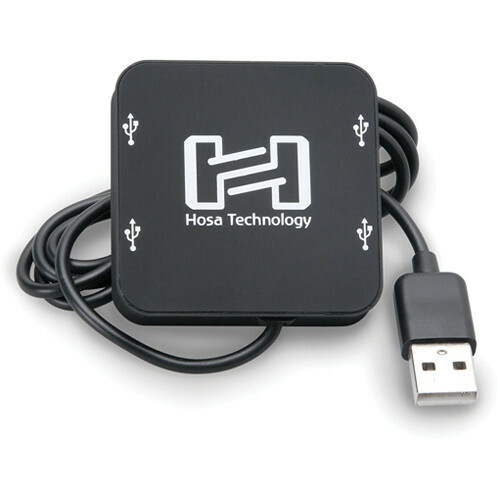 The 4 Port USB 2.0 Hub from Hosa Technology is used to connect up to four devices to a single computer USB port. The USB ports provide data transfer rates of up to 480 Mbps. Powered via USB, the hub is ideal for use with external hard drives, audio interfaces and MIDI controllers. The four USB ports are capable of providing burst data transfer rates of up to 480 Mbps. The hub is fully compliant with the USB 2.0 serial bus interface standard. It is backward compatible with all USB 1.0 specifications. Box Dimensions (LxWxH) 6.0 x 3.3 x 1.0"
4 Port USB 2.0 Hub is rated 5.0 out of 5 by 1. Rated 5 out of 5 by NuSelf from Small, but big!! Small footprint, but big on features and price! Great for multiple USB devices. Lovin' it.